We are headed to OKC and completely decked out in our IVF garb. I know...nerds! 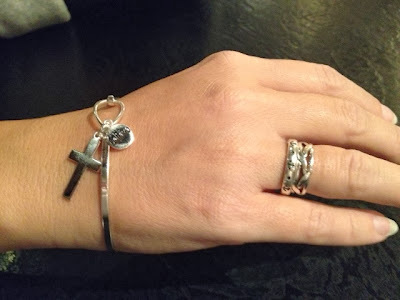 I got a new ring with anchors to go with my believe bracelet from last cycle. 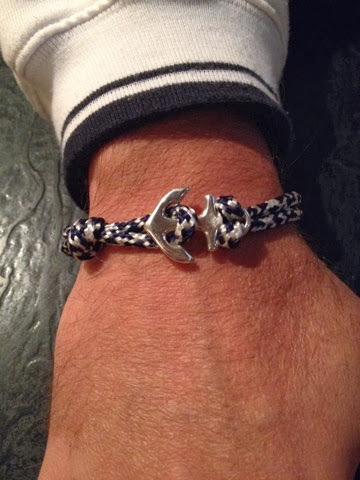 Todd got an awesome new anchor bracelet, too. 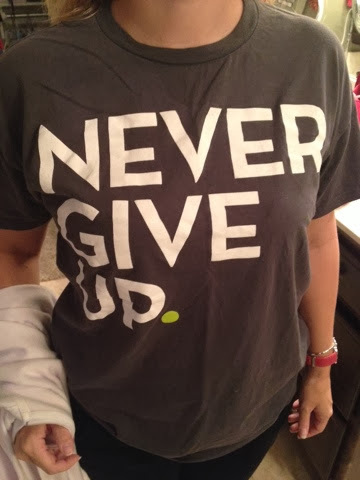 ...and Never Give Up tshirt. 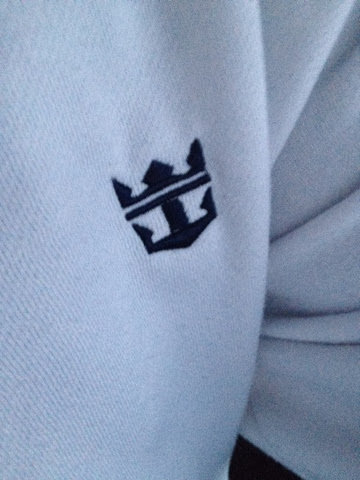 Todd is, also, wearing his Crown & Anchor sweatshirt from our cruises. I'm not posting any pictures of my face today because I can't wear make-up. 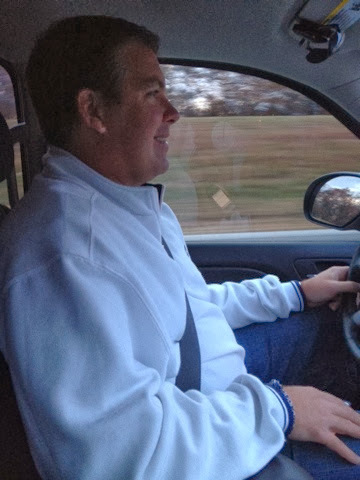 However, check out my cute chauffeur. We were hoping for 9 eggs based on my ultrasound. 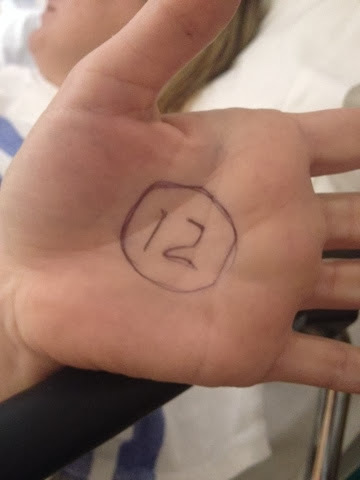 Dr. Bundren got 12!! The anesthesiologist wrote it on my hand, so I wouldn't ask Todd a million times. Brilliant! He, actually, left 2 in there because they were close to an artery and didn't look mature. Then, they just came back here and told Todd our sperm count looked low. He's having to give a sample, although our urologist in Tulsa said there were no sperm showing in his samples. Pray they can get enough to fertilize all of the eggs! Talk about a bubble burster!! 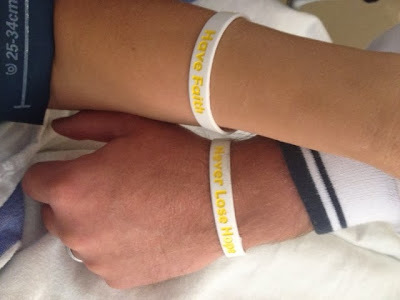 Also, we got new bracelets when we got here. Have faith. Never lose hope. I'm trying! They had to thaw 2 of our 3 vials, but they found motile sperm! Whew!! That was scary. 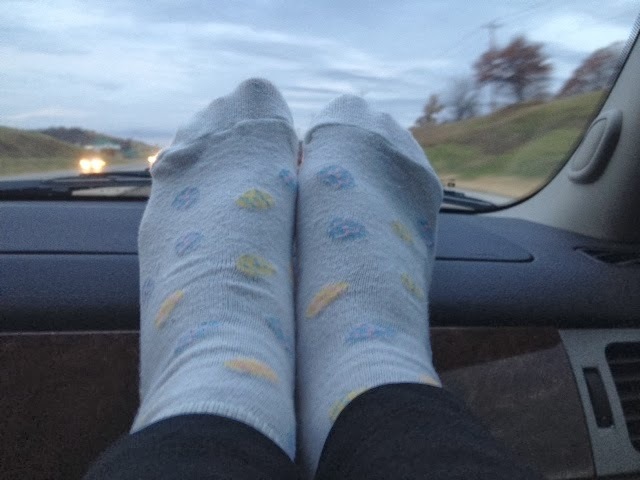 We are now headed back to Tulsa, and this girl is sleepy! Well, we just got a very unexpected call from a blocked number. I answered to find our embryologist, Camille, on the other end. I immediately began crying because I knew this wasn't a normal call. I thought she was calling to report none of our eggs were fertilized. She told me she never makes this phone call, but she's been anxious about our case all day. You too, huh?! Anyway, she was calling to say TEN of the 12 eggs fertilized! I about died from relief. We hope half of them will be fertilized and make it to tomorrow, so 10 is a great start. Dr. Bundren had told Todd he expected 10 to fertilize, but with the sperm issue, we were unsure. She said she didn't find any sperm in the fresh sample Todd provided today. She got all of the ones she used from the second frozen vial. She had to give them Pentox, which is a drug to wake them. However, it only lasts about 20 minutes, so it doesn't effect them in the long-term. As they awoke, she moved the live ones to a fresh petri dish to use for the ICSI process. As a reminder, ICSI (intra-cytoplasmic sperm injection) is how they fertilize our eggs because of Todd's vasectomy. They clean the sperm and inject one into each egg using a needle. It's hard on the eggs, which is why we only get a 50% success rate for pregnancy. Anyhow, we are relieved. I cried. Todd hugged me. It just added to an eventful retrieval day! Here's another video. It's short, sweet, and lacking music. Just pretend I'm singing "Lean On Me" while watching. It's the ICSI process showing how they fertilize our eggs with sperm...one at a time. This video is so cool! I'm terrified of spiders, so I call our exterminator anytime something moves around here. This is what Todd says our IVF process looks like...glowing from the bug spray! Ha! I just realized today is exactly 6 months after our first embryo transfer. For some reason, that gives me peace. Todd is getting my Progesterone shot ready, and then we are going to sleep. I'm feeling quite a bit of discomfort, so I welcome bedtime. Goodnight! Thank you for your prayers! That's the most anyone can do right now.